Polyurethane is an incredibly resilient, flexible, and durable manufactured material that can take the place of paint, cotton, rubber, metal and wood in thousands of applications across all fields. Polyurethane may be hard, like fiberglass, squishy like upholstery foam, protective like varnish, bouncy like rubber wheels or sticky like glue. Since its invention in the 40s, polyurethane has been used in everything from baby toys to airplane wings and continues to adapt to progressing techniques and technologies. 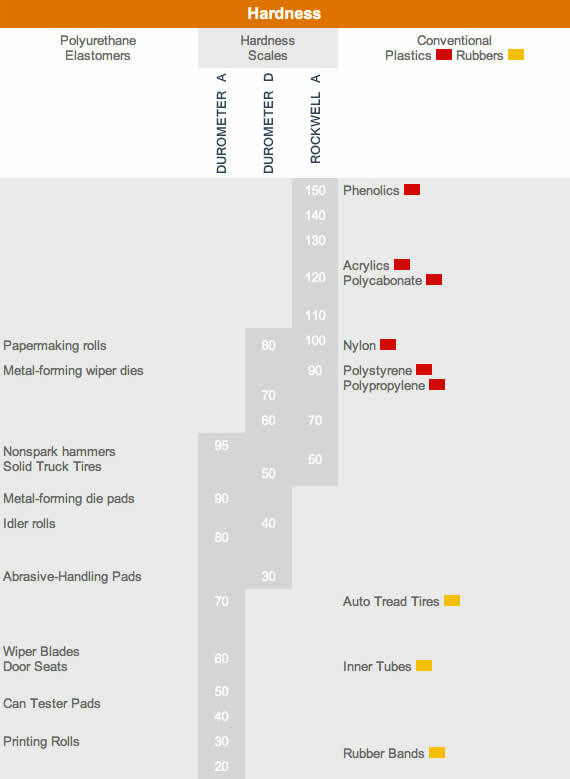 The chart and information below may help in assisting you with your material selection. The hardness of a product is a good place to start in selecting a plastic or rubber for your parts. However, the hardness does not serve well as a predictor of other properties such as strength or resistance to scratches, abrasion, or wear, and should not be used alone for product design specifications. To make the proper selection we can provide you with material spec sheets. You will find most of the information you need in this document. If a sample is required, please make that request. 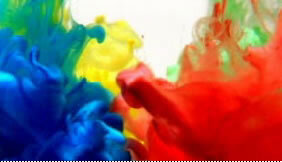 COLOR: In most cases a pigment can be added to the polyurethane system. Our favorite color is black, did we mention our favorite color is black! ABRASION RESISTANCE: In applications where severe wear is a problem, polyurethane usually offers several times the wear life of ordinary rubber, plastic and even metal. In products such as solid tires, an eightfold improvement compared with conventional rubber is not uncommon. FLAME RESISTANCE: Special formulated compounds of polyurethane, tested in accordance with ASTM D635 are self-extinguishing. HEAT RESISTANCE: Products of polyurethane perform well at moderately elevated temperatures. The usual limit for continuous exposure is 165°F. Special formulated compounds of polyurethane can reach over 200°F. IMPACT RESISTANCE: Polyurethane has significantly better impact resistance than structural plastic. OIL AND CHEMICAL RESISTANCE: Polyurethane has excellent resistance to oil, solvents and many chemicals. Test results have shown polyurethane to last up to 20 times longer than rubber when immersed in truck oil and fuel. ADHESION: During fabrication of composite parts, polyurethane can be readily adhered to many metals, elastomers and plastics, with bond strengths that often exceed the tear strength of the polyurethane itself. COEFFICIENT OF FRICTION: Polyurethane has a low unlubricated coefficient of friction. This characteristic, coupled with its superior abrasion resistance and load-bearing capacity, is an important reason for its use in bushings and bearings. FLEX PROPERTIES: Polyurethane resists cracking under repeated flexure, as evidenced by its successful use in many dynamic applications. Our polyurethane can be used in very thin sections because of its exceptional strength and toughness. MACHINEABILITY: The machineability of polyurethane approaches that of some metals and is similar to many plastics. It can readily be drilled, routed, sawed, or turned and shaped on standard metalworking equipment by experienced operators familiar with normal procedures for handling plastics.